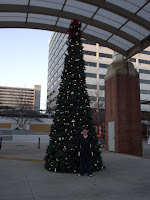 Looking for Knoxville Christmas lights and photos of Market Square Mall? These photos were all taken on Market Square Mall in downtown Knoxville, TN and in Krutch Park on Nov. 27, 2010. Visiting made for a perfect afternoon. 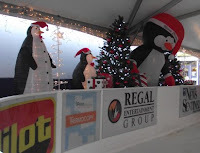 We watched the skaters glide at Knoxville's Holidays on Ice on Market Square Mall were happy to notice that no one fell. The skate patrol was on hand to be sure that everyone was skating Judging from the smiles on the skater's faces everyone was having a good time! After this we bought a cup of Wassill from one of the vendors who were set up. It was hot, tasted great and hit the spot perfectly. 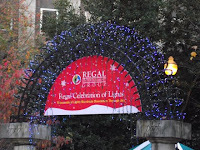 Regal Celebration of Lights entrance. We walked over to the entrance at Krutch Park to see more Knoxville Christmas Lights and take additional photos of the Market Square Mall are. photo taking opportunities. The people we ran across were all friendly and in a good mood. That only helps make the experience even better. Parking is free at the Locust Street and State Street parking garages. This makes visiting even more enticing. When you finish looking at the Knoxville Christmas lights and Market Square Mall there are several businesses along Gay St. to be explored. It's a family friendly fun place to be! You may have so much fun exploring that you have to make two trips to see and shop all that you want. Have you heard about the Comcast Christmas in Chilhowee Park? 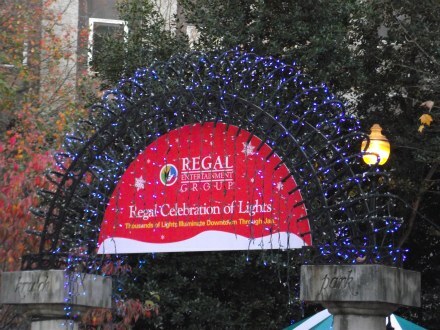 These Knoxville Christmas lights are up and ready to be toured through Jan. 2, 2011.